- The Loose Cannons & XTRA 1360 Fox Sports broadcasting from Bruski from 3-6pm! Join us for March Madness tonight! 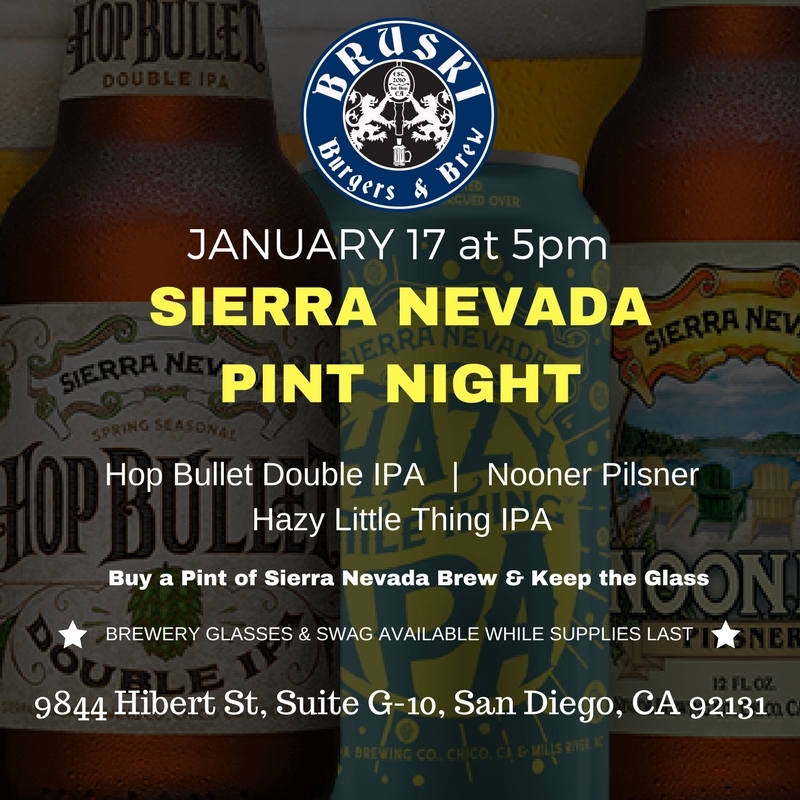 Join us at Bruski Burgers & Brew (Scripps Ranch) for Pint Night! 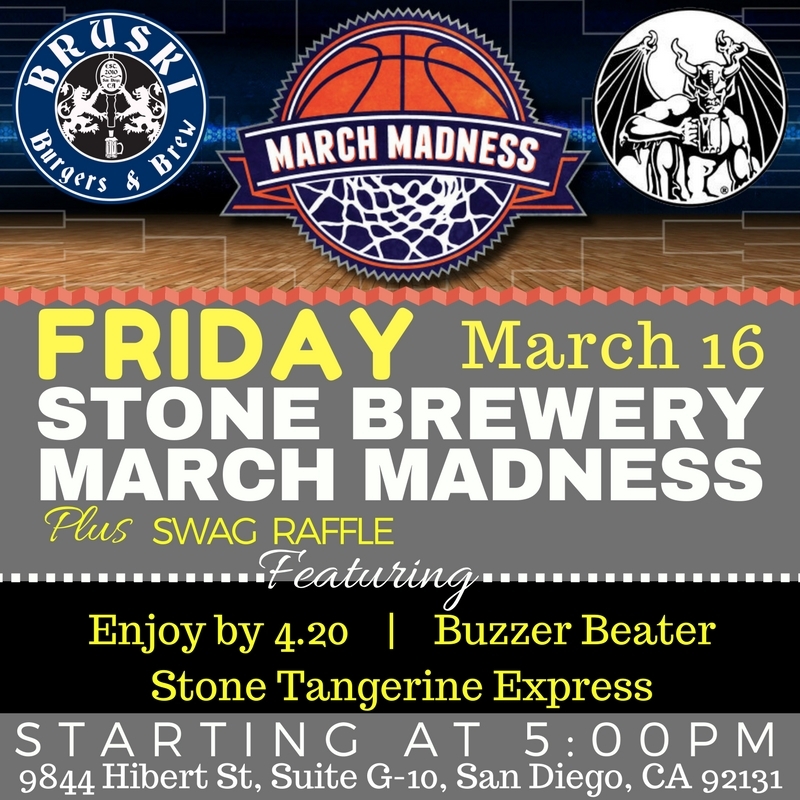 Join us at Bruski Scripps for March Madness!! 1. Place your picks for your favorite breweries and prospective beers at the Scripps Ranch location before Monday 3/12. 2. Come back to Bruski throughout the whole month to watch great basketball and drink your favorite beers to the Final Four! 3. If all you beer picks are correct and you choose the correct winner of the bracket, you will be entered to WIN a Bruski $100 gift card, Bruski t-shirt, and hat. We will be featuring the best of the best SD craft beers on tap all month long! Come by for extra brewery swag on 3/14 (Alpine Pint Night), 3/16 (Stone March Madness Event), 3/28 (Firestone Walker Pint Night) and 3/29 (Societe Pint Night). Join Bruski Burgers & Brew for Modern Times New Beer Release BOOMING ROLLERS IPA. Brewery swag will be available while supplies last and one brewery tour will be raffled off. 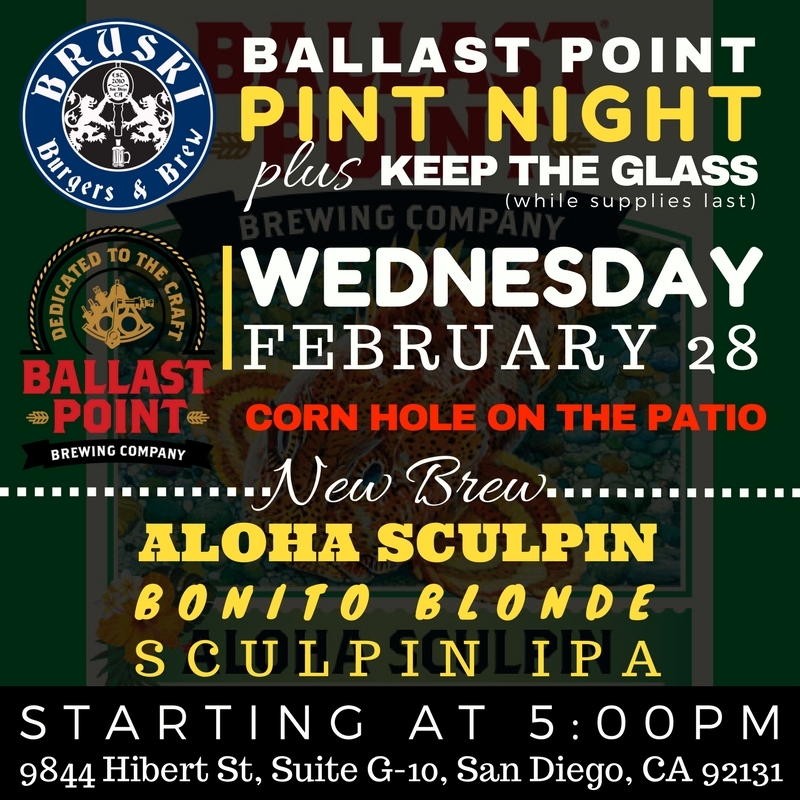 Join Bruski Burgers & Brew (Poway) to check out the Ballast Point new brew release ALOHA SCULPIN and keep the pint glass! Brewery swag available while supplies last. Join Bruski Burgers & Brew (Scripps Ranch) to check out the Lagunitas new brew release SUMPIN' EASY and keep the pint glass! Brewery swag available while supplies last. 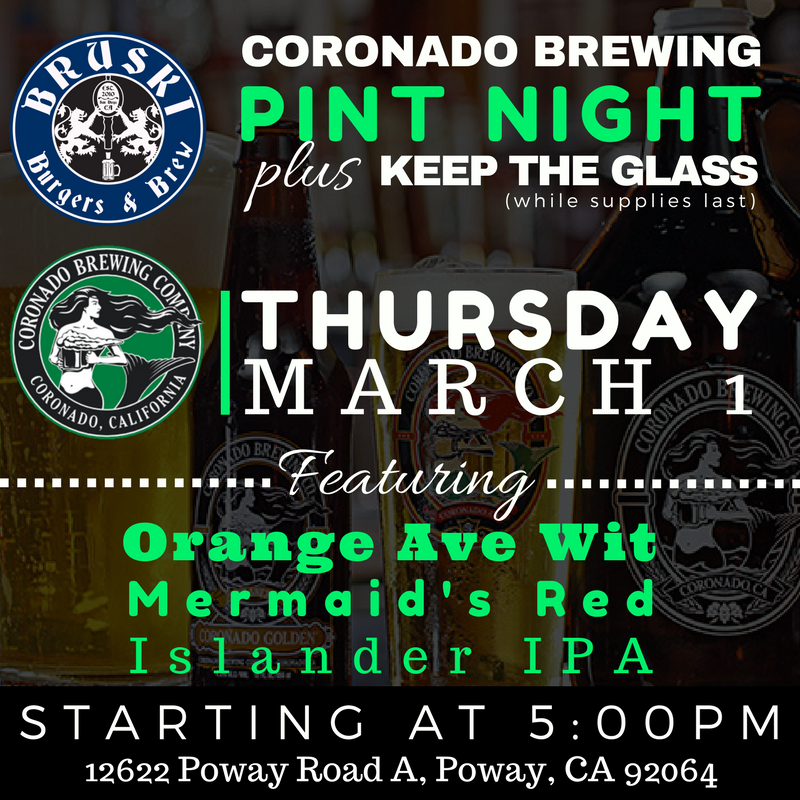 Join us for Coronado Brewing Pint Night and keep the glass! Join us at Bruski Burgers & Brew (Scripps Ranch) for Pint Night featuring a variety of new brews from Ballast Point Brewing Co. including Aloha Sculpin, Bonito Blonde, and Sculpin IPA. Join Bruski Burgers & Brew to check out the Belching Beaver Deftones new beer release Good Morning Beautiful. Buy a pint of Belching Beaver Deftones and keep the glass. What beer will dominate, Latitude 33 Blood Orange or Mike Hess Blood Orange? Kick the Keg and keep the handle! Join us for Latitude 33 Brewing Pint Night and keep the glass! Join Bruski Burgers & Brew to check out the Stone Brewing new SCORPION BOWL IPA release and keep the pint glass! What beer will dominate, Ballast Point Grapefruit Sculpin IPA or Ironfire Grapefruit IPA? Join us for Ballast Point Night and keep the pint! Join Bruski Burgers & Brew on Valentine's Day for dinner. Join Bruski Burgers & Brew to check out a Green Flash new release and keep the pint glass! Buy a pint of Bell's brew and keep the glass. Brewery glasses and swag available while supplies last. 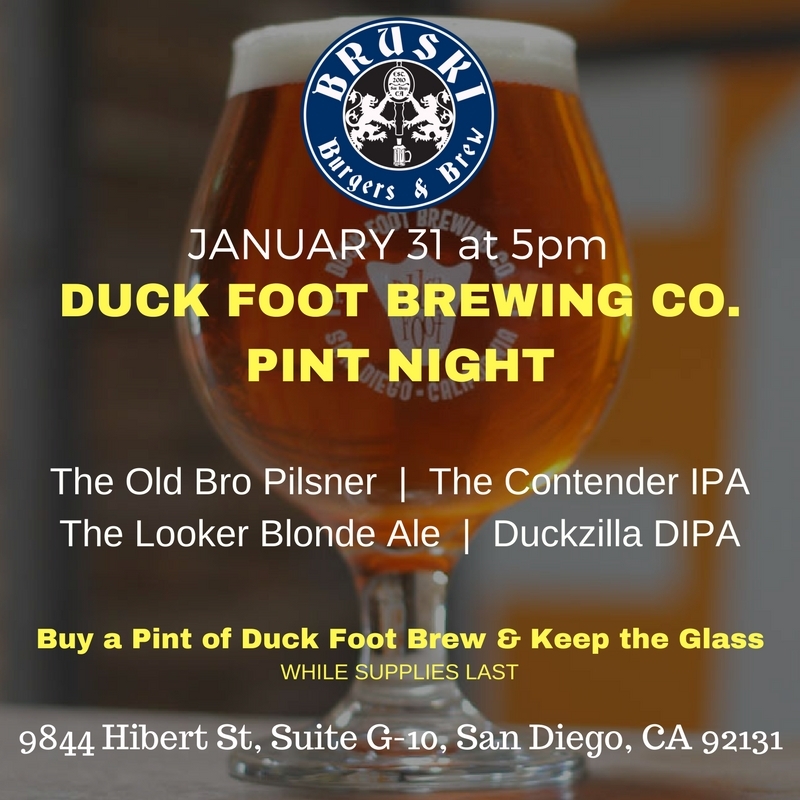 Buy a pint of Duck Foot brew and keep the glass. Buy a pint of Iron Fire brew and keep the glass. Please join Bruski Burgers & Brew in welcoming a new brewery to our rotating line up. 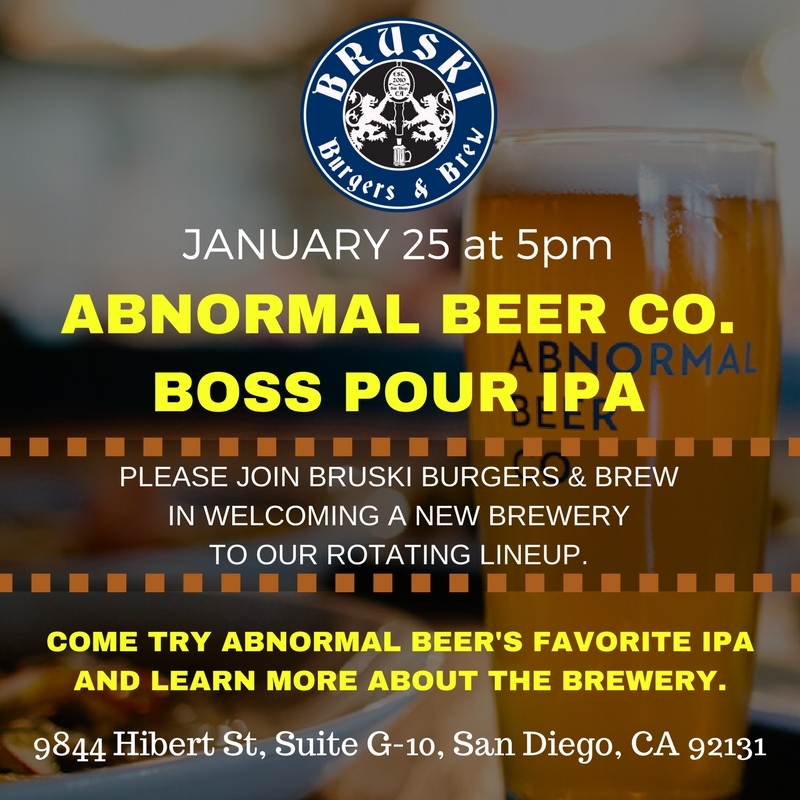 Come try Abnormal Beer's favorite IPA and learn more about the brewery. Buy a pint of Duck Foot brew and keep the glass. Brewery glasses and swag available while supplies last. Buy a pint of Sierra Nevada brew and keep the glass. Brewery glasses and swag are available while supplies last. Buy a pint of Golden Road brew and keep the glass. Brewery glasses and swag available while supplies last. Join us for the 2018 College Football Playoff National Championship game ALABAMA CRIMSON TIDE -vs- GEORGIA BULLDOGS. Happy hour specials available during the game, over 25 beers on tap, 12 varieties of wine to choose from, and chef-prepared foods including antibiotic free beef patties and chicken breasts. ROLL TIDE or SICK EM DAWGS? Buy a pint of Ironfire Brewing Company brew and keep the glass. Brewery glasses and swag will be available while supplies last. 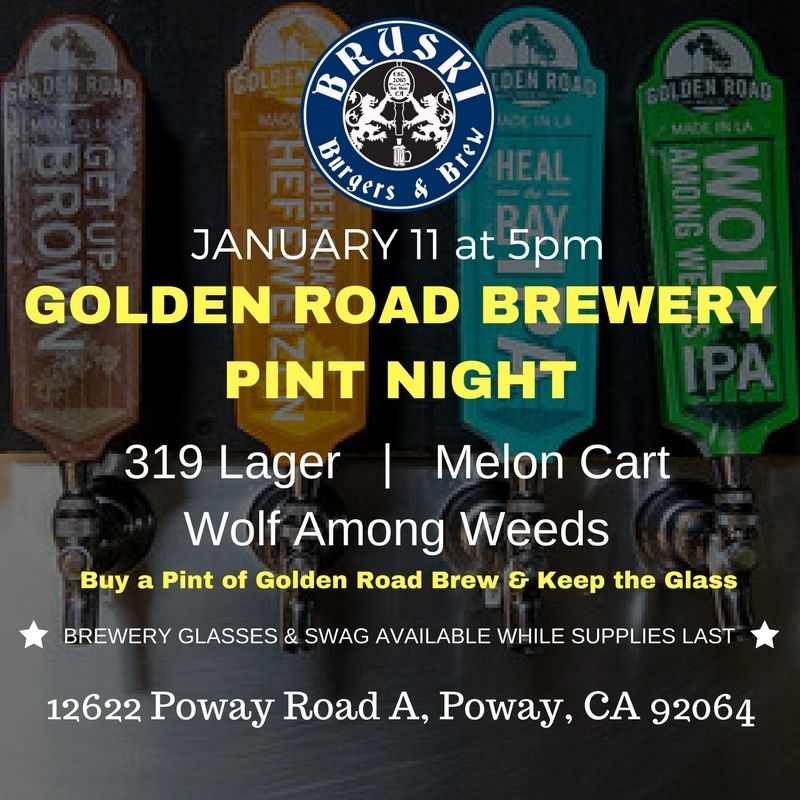 Join Bruski Burgers & Brew (Poway) for Belching Beaver Brewery Pint Night. Purchase a pint of Belching Beaver Brew and keep the glass. Brewery swag and glasses available while supplies last. Check out our Facebook event page for more information, we look forward to seeing you there! Bruski Burgers & Brew (Scripps Ranch) Pint Night featuring a variety of brews from Booze Brothers Brewing. Buy a pint of Booze Brothers brew and keep the glass. Brewery glasses and swag will be available while supplies last. The first customer to KICK THE KEG takes home the tap handle! Ballast Point Pineapple Sculpin IPA vs. Stone Tangerine Express IPA. Come drink some delicious beer and support your favorite brewery. Event starts at 5pm sharp. Brewery swag will be available while supplies last. 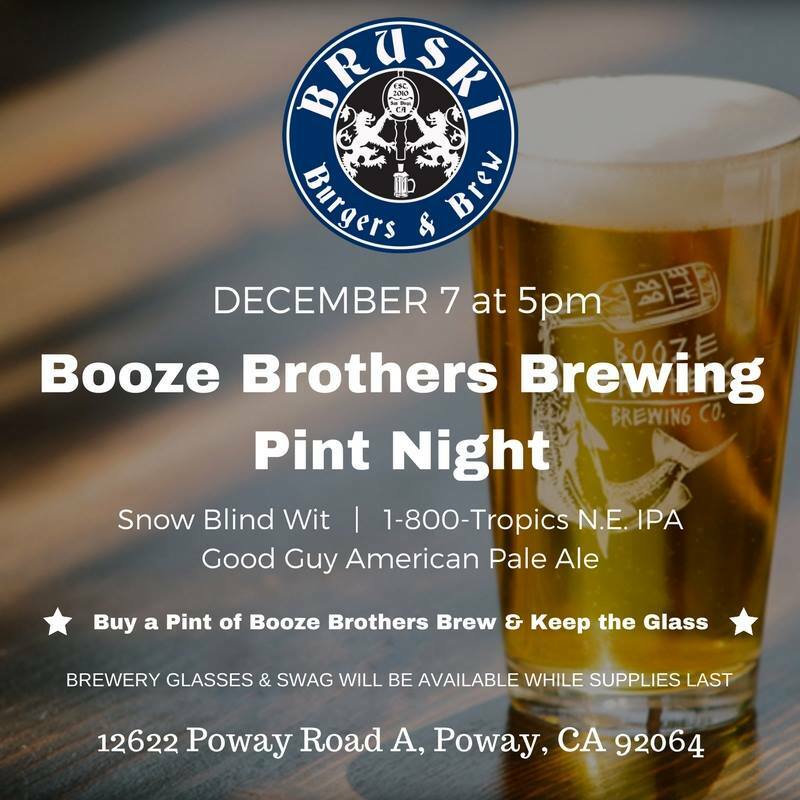 Join Bruski Burgers and Brew, at our Poway location, for Booze Brothers Brewing Pint Night. Purchase a pint of Booze Brothers Brew and keep the glass. Brewery swag and glasses available while supplies last. The first customer to kick the keg takes home the tap handle! Belching Beaver Hop Highway IPA vs. BNS Revolver IPA. 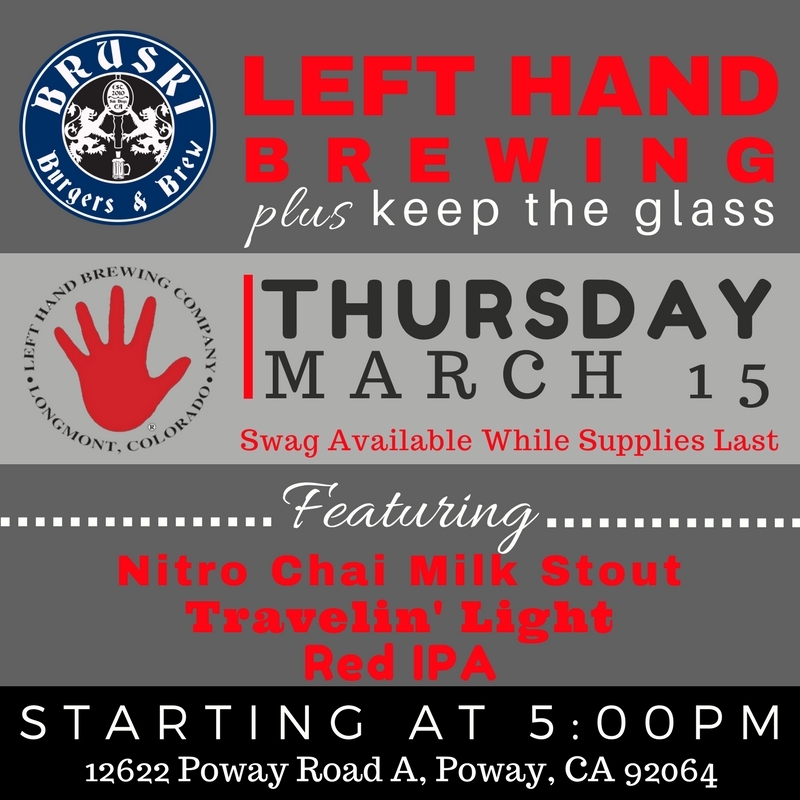 Come to our Scripps Ranch location, drink some delicious beer, and support your favorite brewery. Event starts at 5 PM sharp! Brewery swag will be available while supplies last.